After falling behind early and being pushed to the end in every set without a key starter, Penn State was able to work through the adversity for a four-set victory. The Nittany Lions were playing without 6’4″ freshman middle blocker Kaitlyn Hord, who is fifth on the team in kills per set (2.30) and leads the way in hitting percentage (.379) while ranking second in blocks per set (1.22). Still, they out-hit Purdue .246 to .204 and dominated the block chart, 13-6. 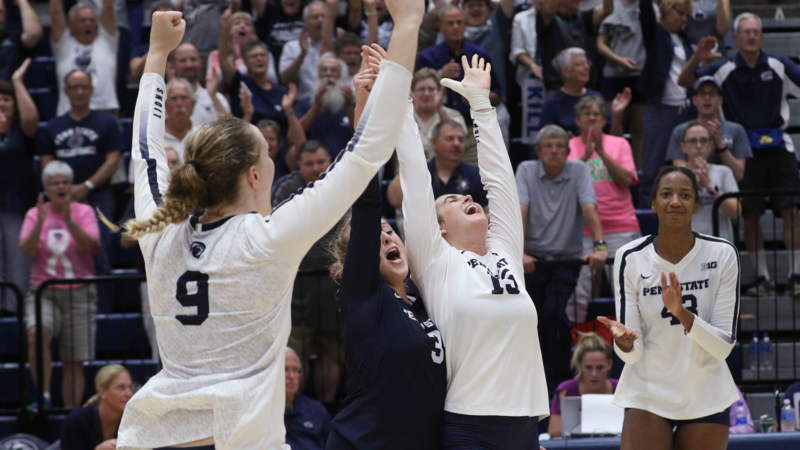 Penn State has plenty of other freshmen who contribute beyond Hord, which was on full display with Jonni Parker (18 kills, .271, 8 digs, 3 blocks, 3 aces) and Amanda Phegley (6 kills, .667, 2 blocks) who specifically filled in for Hord. The seniors were also strong in Taylor Leath (13 kills, .220, 11 digs), Nia Reed (11 kills, .167, 5 digs, 4 blocks) and Bryanna Weiskircher (50 assists). Junior libero Kendall White also added 27 digs. Purdue couldn’t get their first VolleyMob ranked victory of the season, but they showed strong fight and balance, with four players in double-digits for kills, thanks in part to Hayley Bush (50 assists, 5 digs). Brooke Peters (29 digs) led the match in digs, while those top attackers were Sherridan Atkinson (15 kills, .151, 7 digs), Grace Cleveland (14 kills, .186), Caitlyn Newton (13 kills, .276) and Blake Mohler (11 kills, .421, 3 blocks). Next Up: Penn State heads back home to face an even higher ranked opponent as they host #4 Nebraska on Saturday night. Purdue meanwhile heads to the road to take on #21 Iowa in another Saturday night showdown. The Iowa Hawkeyes got a nice encore victory to their upset of #5 Wisconsin, in which they swept Rutgers to grab a winning record in Big Ten play. For the Scarlet Knights, they can at least take away competitive sets in the first two, though they remain without a win in the Big Ten. Additionally, Rutgers can take away some offensive success after hitting .284 led by Sahbria McLetchie (12 kills, .296), Beka Kojadinovic (11 kills, .300) and Tali Marmen (8 kills, .250). Setter Inna Balyko (34 assists) also kept things balanced. It wasn’t enough though, as the Iowa offense was even more impressive in hitting .398 as Taylor Louis (13 kills, .478, 4 blocks) was unstoppable. Cali Hoye (12 kills, .276, 3 aces) and Brie Orr (32 assists, 8 digs, 4 kills, .800, 2 aces) also pitched in with high totals. The Hawkeyes added to it all by out-blocking Rutgers 8-4 and had a 6:3 serve ratio compared to 3:9 for the Scarlet Knights. Next Up: Iowa has a big top 25 showdown with 25th-ranked Purdue at home on Saturday night. Rutgers continues to search for their first conference victory when they take on Indiana on the road. So far this season, Indiana has been a nice surprise under new head coach Steve Aird. They’ve been competitive and gotten some victories, but this one was all about Nebraska who outside of a tight second set were the much stronger side. The Huskers wound up hitting .301 – even after a lackluster first offensive set – while holding Indiana to an .094 mark. Contributing to that was the difference in serving and passing, as Nebraska had more aces (7-2) on two less serve errors. Individually, Nebraska was led by their outside hitter trio of Jazz Sweet (11 kills, .435, 5 blocks), Lexi Sun (11 kills, .280, 9 kills, 4 blocks, 2 aces) and Mikaela Foecke (10 kills, .259, 9 digs), who combined for 32 of the team’s 38 terminations. Nicklin Hames (31 assists, 10 digs), Kenzie Maloney (11 digs, 4 aces) and Callie Schwarzenbach (3 kills, .250, 9 blocks) also pitched in. For Indiana, Hayden Huybers (7 kills, .400, 3 blocks) and Deyshia Lofton (7 kills, .136) led the attack out of the middle. Victoria Brisack (16 assists, 10 digs) also had a double-double at the setter spot. Next Up: Nebraska begins a four-match road trip that will define their abilities to go for another Big Ten title, starting Saturday at #11 Penn State before meetings at #3 Minnesota and at #5 Wisconsin next week. Indiana meanwhile comes back home for a Saturday meeting with Rutgers.